IDEA Code Inspections discover code smells and bugs in real time, while you are writing your code. By the way, this is one of the reasons, why you should be using an IDE, not a text editor (like Sublime Text or Vim) for writing code. There are many checks you can reconfigure, and you can also create profiles with different settings and therefore even have different profiles for different projects. It is frustrating when you checkout branch of your colleague to do a code review, and the code in IDEA starts glowing with red and yellow. How did they miss this? Easily - you do not have the same settings! 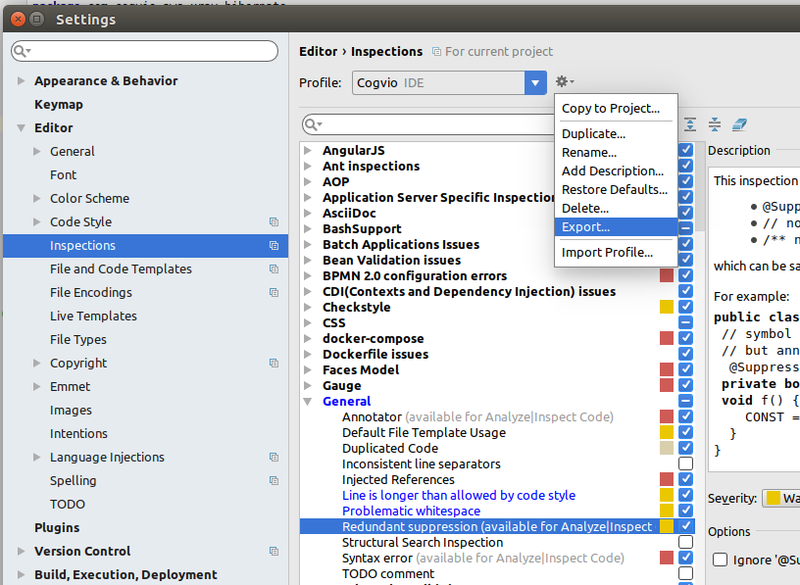 Luckily, Code Inspections can be easily exported and imported. You just have to know where to find the actions. Code Style is also something you can easily export and share. Moreover, when you happen to be using Java, like me, you can even import CheckStyle configuration! This way, you get code reformating to match coding style of your team and your CI basically for free. When you have the settings exported, the last step is to commit them to your project. If you do not know where to put the inspections, just create a docs/ directory and put them there. Tell me in the comments, if you are already sharing the settings in your team or if you will start, as the first thing tomorrow :) Also, do you know any other useful settings that can be exported and imported others might not know about?